Did you know that Obama takes credit for creating the 'green jobs' of Chiropractors, janitors, hair stylists, pharmacists, real estate agents, waiters, chauffeurs, child care workers, and legislators? SEATTLE, Wash. — Hearing the term “green jobs” brings to mind images of people installing solar panels or constructing wind turbines. Not maintaining laundry machinery, which is what Mike Mitzel does for a living. Mitzel is an alum of the green jobs training initiative. He now works as a maintenance mechanic for the University of Washington’s Consolidated Laundry Facility. Mitzel has plenty of company in those green-job-training graduate ranks; in 2009 President Obama signed into law the American Recovery and Reinvestment Act, providing $500 million for research and green jobs training. 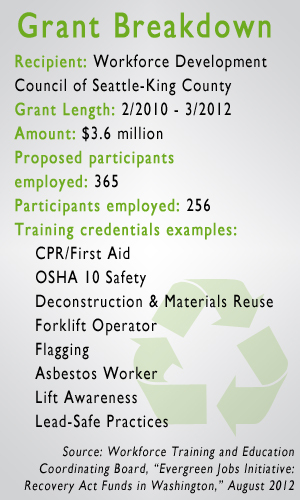 In Washington, $16 million went to green jobs training. 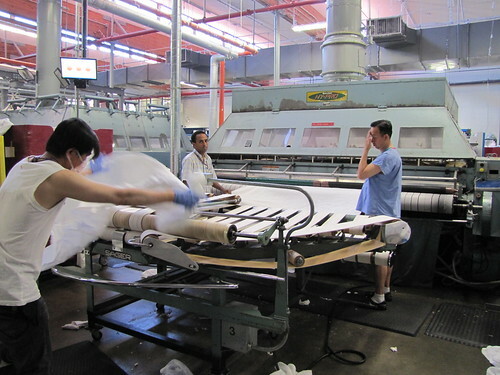 Mitzel’s facility cleans 40,000 pounds of laundry a day – 14 million pounds every year. “We just have to keep the show going, the show must keep going no matter what,” Mitzel says on a recent tour of the facility. Mitzel walks quickly past giant washing machines, 600-pound dryers, long conveyor belts moving sheets and blankets through irons and presses. He pauses to reach his arm into a giant ironing machine and fish out a tangled sheet. “Until we take care of this the machine won’t work,” he says, sweat beading on his forehead amidst the churning machine and hot laundry. But Mitzel didn’t go looking for a “green” job. He just needed work. Mitzel has years of experience in building maintenance but was unemployed, off and on, during the height of the recession. That’s when he took classes in building operations and lighting efficiency that were funded by the green jobs initiative. He says he got a lot out of the green jobs training classes he took and wants to apply some of the knowledge to his current job. He plans to research low-flow toilets and more efficient lighting systems for this facility. Mitzel’s job is indeed green, according to Alan Hardcastle, a senior researcher with Washington State University’s Energy Program and an expert on green jobs. In 2011 Hardcastle helped put together a survey to tally up how many occupations fall into the “green jobs” bucket in this state. The answer: more than 120,000 jobs. 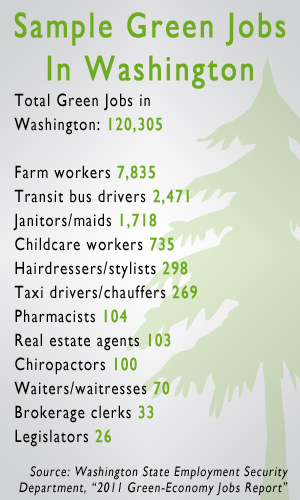 Some of the occupations on the list aren’t what you might immediately describe as a green job. The list of jobs includes fire fighters, plumbers and loggers, to name a few. “Many common jobs are becoming more green by virtue of how the work is done - not just products that are produced,” Hardcastle explains. And that definition has some traction in the environmental community. Jessica Finn-Coven is with the environmental nonprofit Climate Solutions, in Seattle. She says Climate Solutions agrees with Hardcastle’s statements. Climate Solutions was involved in the green jobs initiative, although it did not get any federal grant money. The $16 million in federal dollars that were spent on green jobs training in Washington state went to fund seven different training grants. But here’s the thing: The federal money came without a requirement to verify if any of the jobs the trainees ended up getting or maintaining were specifically “green” – even under the broadest definition of the term. “That type of research was not conducted on the outcomes of this money,” says Bryan Wilson, deputy director of the State Workforce Board, which received the largest federal green jobs training grant awarded to Washington state. Under that grant more than 70 percent of the trainees got jobs. Wilson says the trainings made the unemployed more employable, whether that was for a job that directly benefits the environment, or not. As hard as it is to nail down what makes a job “green,” it’s perhaps even harder to quantify what kind of effect these trainings are having, big picture, on the green economy in Washington state. But people like Mike Mitzel might provide some insight on that. Sitting in the mechanic’s office at the back of the laundry facility above the roar of the machines, Mitzel says he likes his job and the stability it provides for him and his wife. But he used to run his own general contracting company and he wants to be his own boss again. He plans to start his own energy efficiency consulting business to help commercial building owners do things to save money on their utility bills. Mitzel says he got the idea from the green jobs training he did. “It just made me more aware and in tune with how to save energy and it really doesn’t take a whole lot to do it if you’re just aware,” he says. Someday Mike Mitzel might be a green jobs creator himself. For now, he’s just glad to be working. This story is part of The Big Reset, KUOW’s nine-part series that explores how the Puget Sound Region has emerged from the Great Recession.